Home → Delivery → What is Sweetest Day? What is Sweetest Day and why do we celebrate it? I’ll admit it, I had never heard of Sweetest Day until Pamela told me about it when I started working at the flower shop! It’s not on my calendar of things to remember, and it’s probably not on yours, either. But since that time I’ve met many people who celebrate Sweetest Day, so I thought I’d do a little bit of research and figure it out! Here’s what I’ve learned. From Wikipedia: “Sweetest Day is a holiday celebrated in the Midwestern United States and parts of the Northeastern United States on the third Saturday in October. It is a day to share romantic deeds or expressions. 11 states and parts of two states observe Sweetest Day: Illinois, Indiana, Kentucky, Michigan, Minnesota, Missouri, North Dakota, Ohio South Dakota, Wisconsin and West Virginia, along with areas of Pennsylvania and New York. “The first Sweetest Day was on October 10, 1921 in Cleveland. The Cleveland Plain Dealer’s October 8, 1922 edition, which chronicles the first Sweetest Day in Cleveland, states that the first Sweetest Day was planned by a committee of 12 confectioners chaired by candymaker Adam Olis. The Sweetest Day in the Year Committee distributed over 20,000 boxes of candy to “newsboys, orphans, old folks, and the poor” in Cleveland, OH. The Sweetest Day in the Year Committee was assisted in the distribution of candy by some of the biggest movie stars of the day including Theda Bara and Ann Pennington. Hence a Sweet holiday was born! Whether or not it was originally intended to be a day of candy is up for grabs, but over the years it has become a great day to remind a very special someone that she’s Sweet (pun intended!). So, think about it! 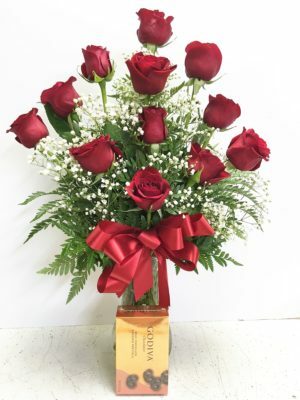 You can remind your sweetheart that she’s still Number One in your book with a dozen red roses and a box of chocolates! Order Your Sweetest Day Roses and Candy today! And we deliver!!! October 15, 2016! Call, Click or Come by!! Let us help you tell your sweetie how sweet she is!